The horrific story finds a battle damaged Enterprise caught between an incurable contagion that threatens to overrun the galaxy, the pull of a dying star, and Klingons poised to attack. Like all of the best Star Trek episodes, “Blood and Fire” finds the Enterprise crew facing their own human fears and failings as they have to weigh the costs and decide how much personal risk to take in order to save the people around them. Gerrold wrote the story of contagion as a metaphor for the AIDS pandemic and the episode is dedicated to the gifted Star Trek alumni the world has lost to the disease: William Ware Thesis, Mike Minor and Merritt Butrick. It was also Gerrold’s intention to challenge the apathy of the public regarding the small sacrifice, yet far reaching power, of blood donations. 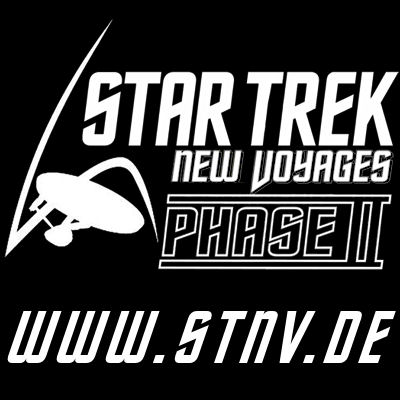 Based on an original TNG script that was shelved because of the mention of a gay crewman aboard the Enterprise, “Blood and Fire” for Star Trek New Voyages: Phase II honors Gene Roddenberry’s vision of a non-judgmental future with the inclusion of a gay couple as part of the principle action of the story. David Gerrold directed the episode which features guest stars Denise Crosby (“Tasha Yar” from TNG), Bill Blair and Evan Fowler; and reintroduces the character of Captain Kirk’s nephew, Peter, played by Bobby Rice. The anticipated release of the conclusion “Blood and Fire: Part Two”, episode 5, is expected in the near future. Pursued and damaged by repeated Klingon attacks, the crew of the Enterprise must respond to the distress call from a Federation research ship. In a matter of hours the ship and crew will be consumed by a nearby star and the crew of the Enterprise will be consumed by an mysterious horror that threatens both ships as the Klingons watch and wait.